Ooh look - DOT has a shiny new front wheel spindle. Seeing as it was raining, Andy came down and we made a start on putting DOT back together. stays that we noticed something amiss. Take a look at that wheel, it doesn't sit central in the link arms. Although they look alike, not all three wheels are the same. 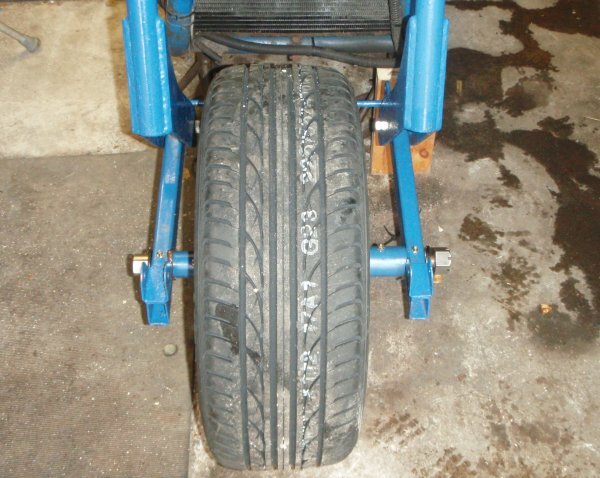 The two rear wheels have a five inch offset, the front wheel has a four inch offset. Ah well - take it all apart again and put it back together once the new tyre has been fitted on the correct wheel.